In July, Sozo International hosted its first short-term team in Kabul in over a year. Due to security concerns, Sozo had postponed all short-term teams since May of 2017. Under constant consideration is the balance of boldness in our vision to serve Afghans (knowing that the security risks we consider are reality for millions in Afghanistan) with wisdom in when to host such groups, considering their safety and the safety of our staff. 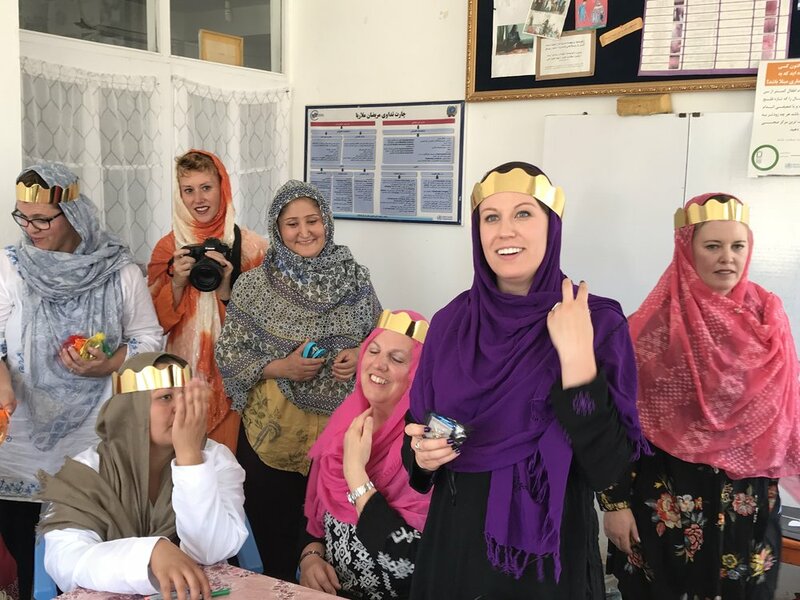 Because Westerners visiting Afghanistan can be more of a target for a range of reasons, Sozo’s staff is on heightened alert and can be under greater risk themselves when caring for visiting teams. ‘But why THERE?’ This is one of the most consistent questions Sozo receives, as do those who travel with Sozo to support our programs and develop relationships in Afghanistan. A country that is still in the throes of conflict where setbacks are plenty, progress is slow and cultural differences present a constant learning curve seems like an unlikely place to work towards transformation. Sozo’s Board, leadership and staff (both Afghan and US-based) feel an undeniable directive to serve in Afghanistan. We believe the calculated risk we take is worth it—because Afghans are worth it. A people that, in some ways, have been forgotten and overlooked by the world, we feel a clear sense of determination to change that. Key to our resolve is continually adjusting our expectations as Americans, who often measure results in what we’re able to check off a list, see in the bank, or label as ‘progress’, a trait shared by most individualistic societies. The value of relationship must come before anything, and what a beautiful thing that is! What was the most impactful part of the trip for you? What’s been your biggest takeaway? Michelle – The friendships I made and the love I feel for the Afghan people. My biggest takeaway is that the people we met want peace, a better life and a future. They are filled with hope and perseverance. Paula –The gratitude and love I felt in Afghanistan is one of the most humbling experiences of my life. But it’s more than that. It’s the difference between those involved with Sozo and those I met in the IDP/refugee homes. The difference isn’t the love or gratitude—that’s strong in either place. There is hope in the eyes of those Sozo serves. Amanda – Every time I visit, I’m reminded that Afghans are some of the strongest people in the world. Despite crippling obstacles, they persevere and have such JOY! My life has been changed through the time I’ve spent with Afghan women, who are courageous and real, heartbroken and hopeful, all at the same time. They are my heroes and my perspective has been changed because of them. What’s was hardest or most discouraging piece of Sozo’s work or Afghanistan? Nicole – That you can’t help everyone. It’s easy to drive around Kabul and see the poverty and the needs; they are EVERYWHERE. And it can be very discouraging to tell the little boy banging on your window “no” or ignore that he is there. While Sozo is making a huge impact and helping so many families, it is just a drop in the bucket. Paula – The first day we visited a home where 34 people, most of whom are IDP’s, live in two rooms that are (together) about the size of the family room in my modest American home. To think that the men give the rooms to the women and children and choose to sleep in a storage container in the courtyard totally debunks the lie that men of that area don’t care about women. These are good people who’ve fled evil. While it’s encouraging that Sozo provides food for these people through grants, I want more for them. I want to see their children attend Sozo schools, their fathers learning a trade in Sozo’s vocational school and their mothers attend literacy classes. I want to see what Sozo has expand. There are so many more needs. If someone at home was considering getting involved with Sozo’s work (either financially, going on a trip, etc. ), what would you say to encourage them? Michelle – I would tell them to do it! I left Afghanistan with more than I came with. I’ve never met so many beautiful people in one place. People who are brave, courageous, and full of love and acceptance for each other. They epitomize ‘love thy neighbor’! Nicole – That you make a difference! Whether you go there, or send someone, or support a child financially, you make a difference for years to come. That little kid in 1st grade will grow up in a school, get a meal every day and will learn to read and write. Their parents will learn to read and write, and perhaps learn a skill to better support their entire family. That kid will eventually graduate and will have the opportunity to go to secondary school, where they can learn business skills. They will eventually get a good job and give back to Afghanistan and be able to provide for their own family, which changes the country in great, amazing ways. And all of that would not be possible without Sozo stepping in to provide for that one kid. Paula – Spend any time around the Sozo community and you will find gifted, compassionate people who have a passion for excellence and positive change. What you give to Sozo goes to those who truly need it. The people of Sozo stand tall with the dignity of giving and receiving respect. They work hard, not only for themselves, but for their communities. Getting involved with SOZO is life-changing. Describe Afghans/Afghanistan using one word. Sozo is grateful for our partners and the teams they send. Their involvement brings us hope and reminds those we serve that they aren’t forgotten, they are worthy, and we are committed to move forward together.